1. Dixie Blossom; 2. Ladies' Fancy; 3. Sunday Night Reel ; 4. Down Home Waltz; 5. Billy in the Low Ground; 6. 4th of July Waltz ; 7. Rocky Mountain Hornpipe; 8. Blue Mule; 9. I Don't Love Nobody; 10. McCraw's Ford; 11. Coming Up the Pike; 12. Shamus O'Brien; 13. Waverley; 14. Flowers of Edinburgh; 15. Peek a Boo Waltz; 16. Arkansas Turnback. 17. Prettiest Little Girl in the County-O; 18. Happy Days and Lonely Nights; 19. Dixie Hoedown; 20. The Waltz You Saved For Me; 21. Marmaduke's Hornpipe; 22. Paddy on the Turnpike; 23. Art's Rag; 24. Sally Johnson; 25. Ozark Moon Waltz; 26. Old Molly Hare; 27. Wink the Other Eye; 28. Sail Away Ladies; 29. Westphalia Waltz; 30. Polk County Breakdown; 31. I've Got No Use for the Women. ; 32. Twinkle Little Star; 33. Whiskey Before Breakfast. I only knew of Art Galbraith through a single track on a Rounder compilation CD - a track which stood out when I heard it - so it was a pleasure to receive this CD for review. I am now a much wiser, and even bigger fan of Mr Galbraith than I was before. Thomas Arthur 'Art' Galbraith was born in 1909, and came from Greene County Missouri, in the Ozark area, on the border between Missouri and Arkansas. The Ozarks have a notable fiddling tradition, in which Art was an important figure. The area was settled mainly by people from the Appalachians looking for fresh territory with room to expand. Although they must have brought music from the English tradition with them, jigs and hornpipes are rare in the Ozark repertoire. Art Galbraith's playing can claim direct descent through the earliest settlers. He learned fiddle from his Uncle Tobe, who learned from his grandfather Andrew Galbraith, a veteran of the war of 1812, a fiddler and a dancing master, who had moved to Missouri from Tennessee in 1841. Art worked for the Springfield Post Office for most of his working life, retiring in the mid-60s. He died in January 1993. The first 16 tracks on the CD were issued by Rounder as an LP entitled Dixie Blossoms, the recordings being made in 1979/80; the remaining tracks date from about 1984. The recordings presented here are almost entirely made up of reels, with a few waltzes. There are a couple of 'hornpipes', but they are played as reels. The tracks all feature single tunes, played three or four times through. According to Reiner and Anick's Old-Time Fiddling Across America, Galbraith had an unusually 'elegant relaxed style, with a light touch'. It is certainly easy on the ear - his intonation is good, and the fiddle tone is sweet. He mostly uses a fairly straightforward bowing technique, with restrained use of double-stopping, droning on open strings and even a some vibrato. The rhythm is strong but relaxed, without that relentless quality which can creep into Old-Time music. Apparently, although he was a frequent dance musician and could certainly play fast for the dancers, when fiddling for his own enjoyment he preferred a slower pace, and this is what we get on this CD. The very informative booklet notes are full of fascinating insights, in particular the comments on the individual tunes from Art himself. From these it is clear that he set out to make the tunes his own, by altering them to suit his ear and style. One example is the well-known Flowers of Edinburgh. He starts with what most of us would think of as the 'B' music, played fairly straight, but with an extra two bars thrown in (it frequently happens that the Old-Timers start with what a British player would consider to be the second half of the tune). The rest of the tune is entirely Art's own, also ten bars long. He learned this tune from his Uncle Tobe, who learned it from his grandfather, and it would be interesting to know how many bars they played. 'Odd' tune structures are of course very much a feature of Old-Time music, for whatever reason, and there are plenty of examples here. Bars can be added or dropped from the standard 8-bar scheme most of us are used to. As already mentioned, most of the tracks are reels, played at an apparently easy pace (try playing along with them, and see how deceptive this is), giving the melodies room to breathe. There are some real Old-Time standards here, such as Old Molly Hare and Sail Away Ladies, all played in Art Galbraith's own settings, but still very recognisable. The waltzes are delivered with great affection and reveal the solidity of Galbraith's technique. Some, such as Shamus O'Brien and The Westphalia Waltz are well-known outside Old-Time circles, while others come from a much more local tradition, like the Down Home Waltz, which is very well named! There is also the splendid Art's Rag which stands out partly because it is the only tune of its kind on the album, but also because it is played with great panache and humour. 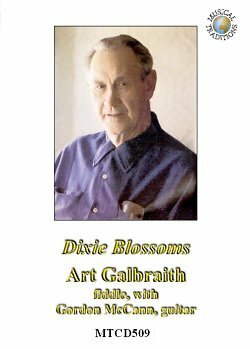 Art Galbraith was in his late 70s when these recordings were made, very much in command of the fiddle, and playing with the authority of his many years of music making. He is accompanied on all the tracks by Gordon McCann in a wonderfully solid, simple and tasteful way. This very traditional American bass-chord, bass-chord guitar picking, with occasional transitional runs in the bass, is easily (and frequently) underrated. This, to my ears, is a perfect example of just how effective it can be. If you already have an interest in Old-Time music, if you want to learn some good American fiddle tunes, or if you just appreciate good fiddle playing, this CD is for you.